• Creates an instant writing surface - even without an available flipchart or whiteboard. • Ready to use solution for every spontaneous or planned meeting/lesson. 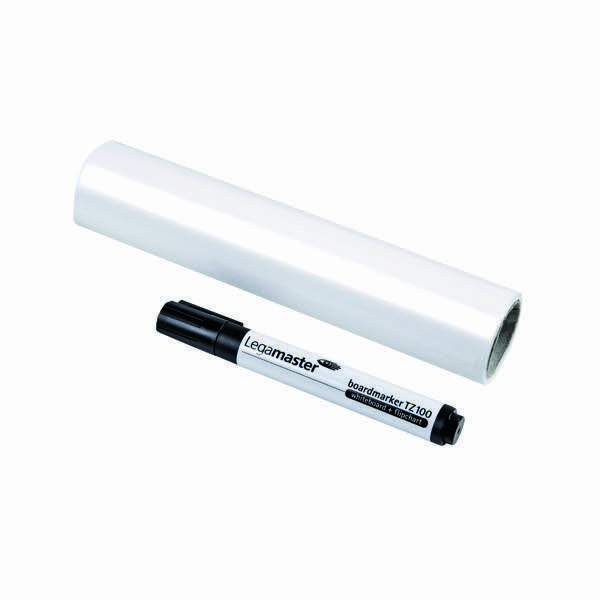 • Electrostatic foil sticks easily to almost any surface, wood, concrete, glass and wallpaper. • No adhesive required, leaves no trace. • Sheets can be repositioned easily. • Presentation notes and cards can be fixed to the foil by simply smoothing on. • Environmentally friendly, 100% recyclable. For a creative alternative to standard paper flip charts and whiteboards, choose this Legamaster Magic Chart. The roll contains 25 sheets of 5mm clear film, each of which will adhere electro statically to any smooth surface including windows, doors, walls and desks. Ideal for use during presentations, meetings and brainstorming sessions, Magic Chart is highly adaptable, creative and space saving.